Ridley Scott's Blade Runner is a neo-noir science-fiction masterpiece. It's a film that has inspired countless since. And it's a film that really didn't need a sequel. And yet! Somehow, against the odds, Denis Villeneuve has directed a magnificent follow-up that feels, if not wholly necessary, both authentic and respectful to the original. He takes everything that made Scott's film so special and builds upon them - expansively. Firstly, there's the visuals. The original's rain-soaked, neon-lit dystopia is now groan-inducingly overused. Yet here it seems fresh all over again. Roger Deakins (cinematographer for Villeneueve's Sicario and Sam Mendes' Skyfall amongst others) has crafted a stunning chiaroscuro: the deep blacks of stormy nights juxtaposed with vivid neon and bright apocalyptic orange. It's a much lighter film than its predecessor - the light of day seems almost eye-opening and miraculous in this context - allowing for more variety in its visuals, while maintaining the trademark pristine noir interiors. This isn't just a fictional metropolis, it's a visual representation of the downfall of America. Every single frame is a piece of art. And then there's the narrative. 2049 repeats many characters, themes and tropes from the original. There's the almost silent protagonist, a detective questioning his own humanity (Ryan Gosling, in typically stoic form). There's the female A.I. coping with her existence. There's detective work through technology, megalomaniac corporations, comparative use of symbolism, and Harrison Ford. Though familiar, they're all subtly updated to fit this new take on a recognisable world, with the film's first half almost replicating the original in microcosm. In its second, all is cleverly flipped on its head. As the film slowly and meticulously unravels, the narrative forms a rich texture. There may visually be more light, but this remains a dark dystopian future built upon exploitation: child labour, corporate greed, prostitution. 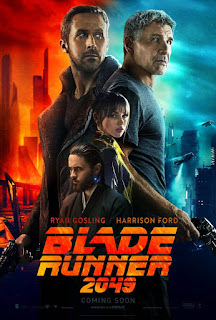 Racism is also addressed more explicitly here - replicants are, after all, slaves used by humans - yet sexual intimacy is handled with care for a genuinely touching scene, unlike the misogynistic mess of the original. This tapestry combines to form the film's central theme: what it means to be human. Love. Intimacy. Procreation. Family. Memory. Death. If all these things can be artificially replicated, then what even is humanity? It's a theme that's overdone in science fiction, but here it's wonderfully anthologized and drenched in thought-provoking ambiguity. Like the original, 2049 is a slow-burning film of creeping anxiety. But with its expansiveness, it does lose some of the brooding intimacy and tightly-woven elegance of Scott's film. The main disappointment though is Jared Leto's Wallace, an underdeveloped villain spouting pop theology. And although the soundtrack, from Hans Zimmer and Benjamin Wallfisch, is beautiful with its great yawning bass and unresolving synth lines, Vangelis' original score is sorely missed. Comparisons to Blade Runner are inevitable, but 2049 is an outstanding piece of cinema in its own right. It repackages the original, along with its imitators, to form a new standard. It is, simply, the ultimate science-fiction film and between this and Arrival, Villeneuve is the new master of the genre. Watch: Blade Runner 2049 is out now.